I hope everyone had a brilliant Christmas! Hopefully Santa brought you all the gifts you were planning for and more! Well for one of my last posts of 2012! (I was going to say last and then realised I had nothing else to do today so might bang a cheeky one out later!) 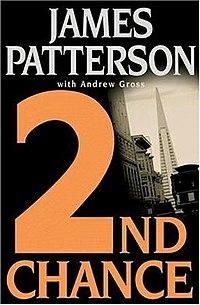 A book review about James Patterson’s second novel in his Women’s Murder Club series, “2nd Chance”. This was a good book. In fact, most of WMC are good. As I said in the last post, the first book was so good that the rest of these books have to do a lot to stay on par. This does so 99% of the time. It has a teeny tiny 1% drop compared to it’s predecessor and as I gave that last one an 8, that isn’t too bad! We open this book, not with any of the WMC girls but with a victim. A priest in fact. Who has just led his young choir out of practice. Next thing, we hear gun shots as what appears to be a drive by occurs. Girls screaming, Priests saving lives and flashbacks of clearly a war are had and then the gunshots stop. Miraculously no one was hurt (a very bad drive by it seems). Then. We get crying. We all know crying after a drive by never symbolises something good. And it isn’t good. I fact, it’s worse than isn’t good. It’s tragic. A girl of 11, never knowing her teenage years, is dead. Shot through the chest. To make it worse (if that’s possible) it’s her best friend of 12 who has seen her die. As soon as children are involved or die you know the main story line is going to be quite a somber one. We find out next that Lindsey is still pining after her dead partner Chris Raleigh (being only a few weeks later) and that she is going to work to just do something. Jill is pregnant and Cindy becomes involved with a character we meet in this book. Claire also has a bit of a torrid time as she becomes the target of this seemingly drive by shooter. People we have met in the previous book die and others become targets for this revenge seeking villain. It ends in quite a columbine fashion and perhaps was Patterson’s reflection on the situation in our own world, where students can kill fellow students in a school, making that much more real. Of course, Lindsey saves the day and seems to have come over the hill that we saw in the first chapter of book 1 that nearly destroyed her. We get more insight into the lives of Cindy, Jill and Claire and the characters are cemented closer to our hearts with every chapter. This book is good. Were it not part of a series it would be extremely good. The characters develop, the plot thickens and then forms full circles and dialogue is witty and engaging. Unlike many serial books, the characters don’t just forget what happened to them in the previous books. Lindsey is quite obviously hurting from the previous one and this is shown to be how she copes with that and moves on, allowing us to accept any future developments with her. Jill’s pregnancy must touch many people’s hearts, being quite a common situation, and her distress and coping mechanisms is a common sight meaning empathy is not hard to find. Like I said previously, Claire is the girl/boy next doors mum and as such, anything happening to her gets your heart racing. Cindy, well is just Cindy. Her situation with the priest is again, one we can understand (more if you have read Rizzoli and Isles!!!) I give this book a 7.75/10. Not quite as good as the last but pretty darn near! Well. What a week! I had a car crash this week. We won’t go into the details just to make sure but suffice to say it was scary! I had already been told my contract at work was to end a week early, meaning a loss of 300 quid! AND I had a crap time getting a taxi home on mad friday (45 mins before I gave up on the company I originally booked!). So all in all I think we can guess I had a pretty rubbish week! But I believe myself to be an optimist so… It’s CHRISTMAS!!!!! Whoop! The time when we can be absolute pigs and not feel guilty! I’d just like to wish all my readers a very Merry Christmas and a Happy New Year! New posts will appear around the 27th onwards but in the meantime, spend time with your family!